If you've read this interview earlier in the day, we'd like to let you know there is updated content! New content added Monday, July 9th, 12:30 PM Mountain Time (Bonnie missed some goodies, and she's very, very sorry). This year, Novel Matters is exploring the question "Why does the novel matter?" We've asked some writers we admire to weigh in on the question, and also to share their creative spark with us here. We'd like to introduce you to Tracy Groot. She's the Christy award-winning author of Madman, which Publishers Weekly called "beautifully written...and entertaining and compelling book" in their starred review. Her first two novels, The Brother's Keeper and Stones of My Accusers, both received starred reviews from Booklist. Tracy and her husband have three boys, and together, run a coffee shop in Holland, Michigan. Her latest novel, Flame of Resistance is the first of three books with Tyndale, with two other historical novels to follow. One is a story about Andersonville, the Confederate Civil War prison, and the other is a WWII story set in France about the miraculous evacuation of the British army at Dunkirk. Novel Matters: Tracy, you're an avid reader. Tell us about the novels have informed you as a writer over the years? Tracy Groot: East of Eden is probably one of the most influential books I've ever read. TG: Steinbeck taught me that as a writer, it's okay to teach. A Tale of Two Cities also affected me profoundly, in ways that are hard to articulate. I promise, that's not a copout; I wish I could figure out why it's such a powerful novel to me. I don't mind to let it remain a splendid mystery. A few other notables are To Kill a Mockingbird, A Tree Grows in Brooklyn, The Killer Angels, Great Expectations, A Christimas Carol, Ender's Game, The Great Gatsby (I hate it that I can't figure that novel out), Jane Eyre, A Wrinkle in Time, The Lord of the Rings...I could go on for about a year. NM: Okay, lots of American classics, and some great British fiction writers mixed in. So, if you could sit down with any writer in history, or living today, who would it be and why? TG: What an incredibly unfair question. TG: Can I sit down with 3 or 4? TG: Okay, if you put my feet to the fire (or deny me chocolate), I'd say that I'd love to sit and have a chat with C.S. Lewis. I'd spend the first 10 minutes giggling like a doofus, then tell him I would've married him if I'd had the chance (because he certainly would have married me). NM: Absolutely understand about marrying C.S. Lewis. All that tweed and quiet days reading. Who else? TG: I'd also love to chat with John Steinbeck. And Patrick O'Brian. And Agatha Christie. And just to mix things up, J.D. Salinger, only because I'd give him a piece of my mind for holing up for the rest of his life. He should have married Harper Lee. TG: Wait, one more--G.K. Chesterton. Oh! And Michael Shaara. NM: Perfect! So you read and read--absolutely necessary for a writer. I want to know about your writing life, how you've put all this influence to work, but first, let me ask What is the one non-writing thing you do that helps you be a better writer? TG: I watch film. Movies, TV episodes, documentaries. Great screenplays inspire me. I am currently in love with Joss Whedan. I like to study great directors. I'll get hooked on a director, and watch all of his stuff to death. I couldn't get enough of James Mangold, and watched 3:10 to Yuma and Walk the Line about a million times. NM: You can't go wrong studying everything that went right with Buffy the Vampire Slayer. It sounds like even when you're not writing, you're feeding the writer in you. Okay, let's get to the really good stuff. You the writer. Do you outline your novels before you write, or are you a feel your way through writer? TG: I tend to do sort of an outline in flux, a combination of outline and feeling my way. Sometimes I'll do some broad strokes on a dry erase board, like plot pivots, and aim for the pivots. NM: Plot pivots? What are they and how can we aim for them? TG: Plot pivots to me are events of varying degrees of import that shift the storyline into another direction. By varying degrees, I mean that I could have a plot pivot as simple as "She picked up a button" or as dramatic as "Emery died"; either way, both mean something to me. "She picked up a button" could mean that Violet realizes the emptiness of her efforts to help the Confederate cause, reduced to making buttons out of seashells because the Union blockade of ports has shut down all trade; is this what she is meant to do? Or is there something more? Should she instead focus on helping the Union prisoners at Andersonville, knowing that to aid mankind will ultimately aid the Confederacy? "She picked up a button" becomes a plot pivot, a decision point for Violet. Sometimes I'll write lines like these on my dry erase board, knowing they contain far more. "Emery died" is a huge, end-of-Act-II type of plot pivot. Either way, when a plot pivot occurs, I'll write it down. The compilation of these one-liners become a stagger-step type of plotline for me. NM: There's a real intuition going on in your writing, a 'trust your gut' aspect that is thrilling and frightening for a writer. Do you have a basic formula for how you start? Which comes first for you, plot, characters, themes, or something else? TG: Every novel is different. Sometimes it's theme, sometimes it's character, sometimes it's plot, sometimes it is vagaries of all three. NM: I love how you allow each story to "be", and work with what it brings you. It's difficult for new writers to trust their instinct, and we're bombarded with advise about how to write a novel. What is the worst piece of writing advice ever offered to you? GT: "If you want to write a novel, you have to pay the price and write magazine articles first." NM: Wait, wait! Isn't that true? Don't we all have to "pay the price" if we want to be allowed to write the stuff we want to write? TG: I say don't waste time. Write what you want to write. You want to write short stories? Write a short story. Poetry? Write a poem. Novels? Write a novel. Blog? Then blog. Life is short. Do the kind of writing you want to do. NM: Okay, I'm loving your gutsy advice about embracing who you are as a writer, hang what “they” say. It isn’t often we come across a writer who isn’t interested in all the rules, yet is still published. TG: Rules are important--they are important to learn, and very important to decide if they fit; important to decide if they should be rules at all for us. "Write magazine article first" wasn't necessarily bad advice, but it was wrong advice for me, disheartening advice. (And it was, after all, advice--not a rule.) I didn't have a place for it. It wasn't in my make-up. But I did it, and when I failed to get published, was absolutely overjoyed; I had no desire to write articles, my desire was to write novels, and I told myself, "There, I did it because someone smarter than me, published MULTIPLE times, told me to, and it didn't work, and now I get to do what I want to do because I earned it." But to follow advice that didn't resonate in the first place, and then to figure that I earned the right to write...that's just silly. I would've saved time and found happiness a little quicker if I'd gone with my gut. That's where Princess Rebellious thinks any sort of writing advice should fall: into the Does This Resonate Arena. Does it resonate? Then do it. Does it not resonate? Then don't. It was my own darned fault that I wasted time. I didn't listen to my gut. Oh, well. You learn from your mistakes. Not a bad thing at all. NM: Sensing a writer with confidence here. I find it's difficult to always keep my head when I spend time online, surfing the industry news sites. The publishing world is rocking on its heels, and it's getting harder and harder to get and stay published. What keeps you writing despite setbacks? TG: I can't not write. NM: Is there an expression of this in your life that illustrates the innate writer in you? I recall examining this question a few years ago, and I reached the astonishing conclusion that it isn’t writing I can’t not do, it’s story I can’t not do. TG: Wow. I think you answered it for me--"It's story I can't not do." Precisely! And thanks! I'll use that for the rest of my life--"It's story I can't not do." I heard a guy say 'Reading is writing', and that's God's honest truth because it's story. Reading puts in to me. There are seasons I spend reading, reading, reading, and ultimately that is writing, writing, writing. Reading is storytelling; you're telling yourself the story as you read it, as it filters down through the filter of you, and ends up in that place you will one day draw upon to write. I call it my compost heap. This is not original; I got it from Tolkien. He said all goes into his compost heap, and I have found that this is so. When I read, or when I engage story through film, it funnels down through my filter and goes to that mysterious heap, where, when I draw upon it later, it is transformed and comes to the page different than how it went in, because of all of the things in my heap that reacted to it, and transformed it. How very individual we are. Our heaps are like no others. NM: It can be tough to stay focused on our individual vision sometimes, especially in these the-sky-is-falling-on-the-publishing-industry times. How are you navigating the changing tides of publishing? TG: My husband is a social media guy, and helps me to pull my cantankerous old-school self into the blinding light of internet day. It's tough. I have to work at it. Part of the navigation is to realize that the tides, really, really, really have changed. I have to make friends with that notion. NM: Make peace with the media frenzy. Good advice. Speaking of advice, I asked you earlier for the worst writing advice. What is the best piece of writing advice you have to offer aspiring authors? NM: Let's talk more specifically about your work. Your new novel, Flame of Resistance is set in a little town called Benouville, in Normandy, France. What role does setting play in your story? TG: Normandy is a hallowed place in American history. I found that I could tell part of the tale of D-Day in Normandy by zeroing in on one little city. NM: Earlier, you told us that ideas for your stories come to you in different ways. How did the seed of your story idea for this novel come to you? TG: I was reading Stephen Ambrose's Pegasus Bridge, a book about the spearhead action of D-Day, and came across a tiny little line about a Germans-only brothel in Benouville. It made me wonder if any French prostitutes worked with the French Resistance. It made me wonder, What would happen if one of those German officers was actually an American spy for the Allies? NM: Now we're all wondering! What do you want your readers to carry away from reading Flame of Resistance? TG: I'd love readers to learn what it was like to live under enemy occupation for not months, but years. I'd love readers to discover that not every German was a Nazi, that the French didn't just lie down and let Hitler run over them; most of all, I'd love readers to find that resistance against darkness is not futile. I'd love readers to wonder if sort of a spiritual enemy occupation is going on around them right now, and think about what they can do to resist. NM: And what about yourself? What did you gain from writing Flame of Resistance? TG: New friends. I love to meet and talk with people who lived through extraordinary circumstances; I also love to connect with people who are professionals in their particular area of interest, and learn about what they do. I had a chance to talk with aged family members who lived through the five-year occupation of Holland, and learned things I never knew. I also had the privilege of interviewing a WWII veteran--a retired and decorated Air Force Colonel--who helped me learn about flying a P-47. He even pulled strings to let me sit in one! Why does the novel matter? TG: In the historic changes that have come to publishing, some good and some bad, one thing has not changed; the world is always looking for a good story. The novel matters because it supplies society with needed diversion, needed respite, and needed truth that may not come when it's served up cold. If we're really lucky, truth may come through a kid named Huckleberry, a ghost named Marley, a hobbit named Frodo, or a place due east of Eden. 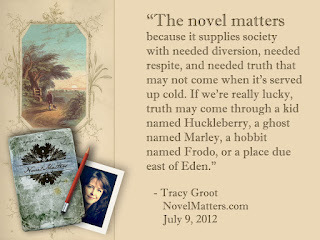 My heart gave a little leap when I saw you interviewed Tracy Groot. I savored Madman and have been looking forward to something new from her ever since. I'll be reading Flames of Resistance. You hooked me already, Tracy. I recently read a novel in which a young man does get the chance to sit down and talk with C.S. Lewis, and Tolkien, and a few other Inklings. Looking For The King, an Inklings Novel, by David C. Downing. The scenes where the MC spoke with Lewis and Tolkien are where the book really shines. So many of Tracy's responses made my writer's heart leap with recognition, the writers that influenced her, her study of scripts, her process for writing changing with each book, and too many more to list. Hey, hey! It's Tracy Groot! Hooray for the Michigan writers! Great interview, Tracy. I love your answers and feel, even more, that I have a kindred in you. P.S. I have a tiny crush on Steinbeck. My husband's okay with it. I think we were twins separated at birth! Love your passion, your reading list, but I'll duke it out with you over C.S. Lewis. I loved him first! Seriously, thanks so much for the interview, Tracy. You gave us so much to embrace, and I can't wait to read Flame of Resistance. Compelling. Tracy, what a wonderful interview! You really gave us a glimpse inside your writer's heart, and it's lovely. I relate to so much of what you said, but most especially your best advice. I so agree. I loved reading about your upcoming novel, which sounds fabulous. I'll let you and Patti fight over CS Lewis. While I love him dearly, I'd rather bum around London with Dickens. Oh my goodness! If I knew nothing about Tracy Groot except her answer to your last interview question, I'd be a fan forever. Truth as poetry, that! I just read the additions. Glad you found those. Especially the part about plot pivots. That's how I plot too. Sometimes those pivots end up falling into place early on, are neatly structured, broken into Acts and everything. Other times it's an organic mess with only a glimpse of patterns peeking through, a mess I'm still sorting all through the first draft. Current work is of the latter sort. Again, thanks so much for this interview. 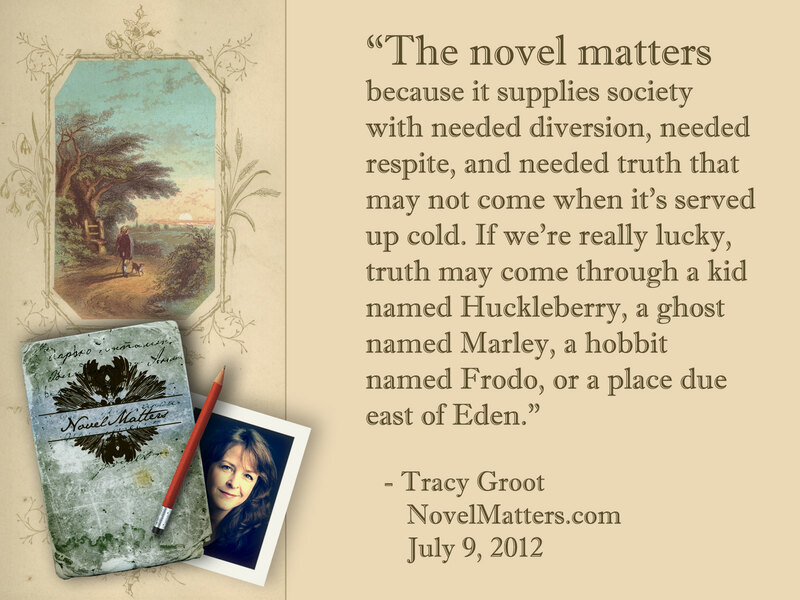 One of those authors I'd like to sit down with for a chat now is Tracy Groot. NovelMatters readers, I've not read Tracy's new book but I have to tell you that Madman raises the bar on Christian novels. It's incredible. I'm privileged to know her. I am not a writer but a privileged long time friend of Ms Tracy Groot. She's the real deal, with a heart as big as the ocean, great insight and wisdom, charming, witty and a faithful friend to the end. She is a treasure. Anonymous, Tracy can hang out here any time. (And so, my dear, can you!) What a great interview. Thank you, Tracy - we are honored! Loved this interview, particularly plot pivots. So happy to see Tracy here and that she has another novel and more to follow. I was trying to explain to someone why the novel matters. Tracy covers it so well. Many thanks. I love your moxie, Tracy! And your ability to hear and listen to your gut. Bravo! Thanks for having me, guys! It was a pure honor, and the best interview EVER--what splendid questions, and what splendid company, especially when they say such nice things. Princess Non-Techno actually signed up to her first blog ever with Novel Matters 'cause I sensed a group of kindreds...though I may have to broker a deal with Sharon to share Charles. (I have a posable Charles Dickens action figure that I perch on a book every time I write. He used to hold a quill pen but it broke off. Now it looks like a cigarette. I think he smokes when I'm not looking. Maybe he's worried about my plotline or something...) Anyway, thanks again for having me and I look forward to learning from you folks! Should I or shouldn't I? Can't help myself...gotta ask...how did G.T. get in here?! Not sure I understand the question, Lynn.